AP DEd Results 2018: 1st year AP D.El.Ed 2018 Results Declared on bseap.org: Directorate of Government Examinations, Andhra Pradesh has released the AP D.Ed 1st year annual examinations Results 2018 on the official Board of Secondary Education, Andhra Pradesh, BSEAP website - http://main.bseap.org/. Students who had appeared for the 1st Year D. Ed Public examination can now log on to the official website, bseap.org in order to check their result. Alternatively, scroll down to the direct links and steps to check the AP D.Ed Results (AP DElEd Results). The examination was conducted by DGE in the month of May 2018. Steps to check AP DElEd Results (AP DEd Results) 2018 1st year: Log on to bseap.org. andEnter Roll number and submit to view the result on your screen. Save and print for future reference. 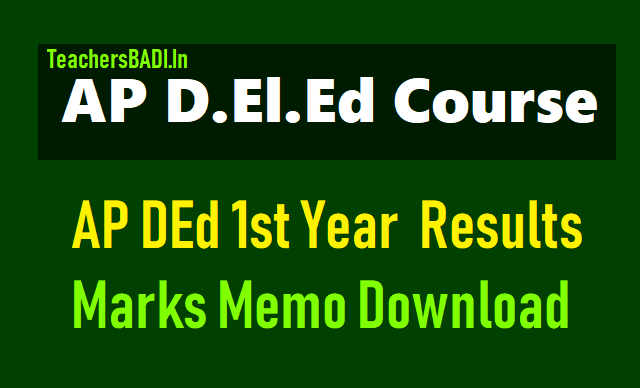 AP D.El.Ed / DEd 1st Year Results, Marks Memo 2018: The results of the D.EI.Ed., (Diploma in Elementary Education 2016-18 batch)and D.Ed., Supplementary(Old Syllabus) 1st Year Examinations, which were conducted from 17/05/2018 to 23.05.2018 are hereby released. A total No. of 66428 candidates have appeared for D.EI.Ed., (New Syllabus) Examinations out of which 61834 candidates have passed the Examination. The Pass percentage is 93.08. Out of 334 Old Syllabus failed candidates who appeared for the examination, 155 have passed. The pass percentage of old syllabus candidates is 46.40. The Dummy Memorandum of Marks of both are hosted on the Web Site www.bse.ap.gov.in for the information of the candidates / Colleges. The candidates who intend to apply for recounting of Marks, have to submit their applications along with fee challan directly to this Office on or before 29.06.2018 duly indicating the subject for which recounting is required. A copy of the Dummy Marks Memo and a self addressed envelop with required postal stamps should be enclosed to the application. The fee for recounting of marks is Rs.500/- (Rupees Five Hundred only) per subject.The fee challan should be paid through AP,CFMS System. The following is the Head of Account for remitting the fee. How to check AP DElEd 1st Year Results 2018: AP DElEd 1st Year Results 2018 released at bseap.org, Check it Now: AP DElEd 1st Year Results 2018 have been released by the Directorate of Government Examinations, Andhra Pradesh on its official website - bseap.org. The Directorate had organized these examinations in the month of May 2018, i.e., from May 17th to 23rd. A total of 66428 candidates had appeared for New Syllabus and 334 for Old Syllabus, out of which 61834 and 155 candidates have cleared the exam, respectively. Candidates who had appeared for the same can follow the instructions below to download their results. The results are also available on bse.ap.gov.in, however it is currently slow and not responding. Candidates can apply for Recounting of their marks on or before 29th June 2018 by paying a fee of Rs.500/- per subject.